On the quiet block of La Puerta Avenue in Boyle Heights, a small bobcat bulldozer was in high gear last week, removing dirt from homes where high levels of lead were found. At least one hundred wheelbarrows of tainted soil were removed from two homes on the block early Thursday, part of an ongoing effort to clean up contamination residents and toxic chemical experts say are tied to emissions from Exide Technologies in Vernon. â€œHow many years have gone by and we didnâ€™t even know the damage [Exide] was doing,â€ said Jovita Morales, one of the homeowners whose soil was removed. The South Coast Air Quality Management Department in 2013 found several times that emissions from Exide had higher than safe levels of arsenic and lead, increasing the risk of cancer and neurological deficits to as many 110,00 residents living near the acid-lead battery recycler. State regulators have ordered Exide to make major changes to pollution control systems at its Vernon plant, and to pay for the clean up contamination at homes like those on La Puerta Avenue. While not admitting any culpability, Exide agreed to pay for blood lead tests for area residents who are concerned about their exposure. Testing, conducted by the county health department, started inÂ April. So far, only 450 people have taken advantage of the free blood tests, but none those tested â€œrequired medical intervention,â€ according to the county. The low number of tests has prompted the testing period to be extended for the second time until Jan. 30, according to county health officials. Earlier this year, state regulators identified 215 homes in Boyle Heights and Maywood as having the highest likelihood of being impacted by Exide emissions. The Dept. of Toxic Chemical Substance Control, DTSC, ordered the company to pay for soil testing and more recently to put $9 million into a fund to be used to clean up all 215 homes. As of Monday, only 104 of those homes had been tested, according to DTSC. Nineteen of the homes were labeled priority one, the highest priority based on lead levels found and whether there are children or pregnant women living in the home. Priority one homes will cleaned first, according to DTSC, which says it will continue to reach out to property owners to encourage them to get their properties tested. DTSC Director of Communications Jim Marxen told EGP the state agency wants the process to go as quickly as possible, and has asked Exide to clean up 2.5 homes a week. â€œWe believe Exide is responsibleâ€ for remediating the damage, he said. Marxen pointed out that [the plant] has been operating since 1920, nearly 100 years. â€œFor that extended period of time, this [assessment area] is probably the place their emissions ended up,â€ he said. The two residential properties on La Puerta Avenue, which sits near the industrial side of town on the border of East Los Angeles, are the latest homes to be cleaned. Soil was removed from two homes in August; one in Maywood the other also on La Puerta Avenue. â€œWe are aiming to get at least five homes [clean] before the holidays,â€ said Marxen. â€œOur target is to get a least 10 to 12 homes cleaned by the third week of January,â€ he added. But getting residents to sign up to get their soil tested has proven difficult, says Marxen. Though there could be a number of reasons why testing is not complete in the assessment area, many residents may find themselves in the same situation as longtime resident Jose Ornelas, 79, who has rented the La Puerta Avenue house where he lives for 28 years. â€œThere was some confusion because the letters they sent were addressed to me,â€ he said in Spanish. If it had not been for Ornelas contacting the owner, soil on the property would not have been tested last month. Lucia Flores, 72, said she initially didnâ€™t want to go through the process of having her soil tested because she wasnâ€™t sure what would be expected of her as a homeowner. â€œIt took me a long time to grow these plants for someone to just come and cut them,â€ she half-jokingly said. However, once the soil is tested, the results are analyzed and labeled as priority one, two, three or below threshold, says Marxen. So far all 104 homes tested have been above the allowed threshold, he added. According to DTSC, 19 homes were labeled priority one, 35 priority two and 31 priority three. DTSC will meet with the residents at least three times to explain the test results and set up a cleaning schedule, which includes soil replacement, dust control measures, air monitoring and yard restoration that includes keeping plants deemed sensitive by the owner. Residents do not have to be at their home while the weeklong clean up takes place, in fact they can opt to stay elsewhere at Exideâ€™s expense, according to DTSC. On Monday, Flores said she is waiting for the results of tests conducted back in October. â€œI worry about my granddaughter who lives here,â€ she said in Spanish, as she watered the plants in her yard. â€œI have heard the [Exide] plant is bad for our health,â€ she said. Exideâ€™s Vernon plant has been closed since March as it installs enhanced systems to comply with Californiaâ€™s air quality standards. The company has invested $35 million on environmental, health and safety measures since 2010.
â€œWe recognize the communityâ€™s concerns and are confident the Departmentâ€™s tough new order provides strong regulatory oversight for cleaning the identified residential properties,â€ said Thomas Strang, Vice President of Environment Health and Safety for Exide. â€œExide is committed to operating a premier recycling facility and working collaboratively with regulators to perform all work necessary to reach his goal,â€ he said. Marxen told EGP the agency hopes the visibility of the cleanup will encourage neighbors to get their yards sampled. Morales saw the clean up taking place back in August and though about contacting DTSC out of concern for her grandchildren, ages nine and four months, who live in the home. The cleanup up cost per property will vary according to the amount of soil to be removed and property type. If there are still funds left in the $9 million community trust fund after the initial group targeted for testing is completed, the remaining money will go towards expanding testing and cleaning beyond the original assessment area, and for testing of commercial properties in areas adjacent to the Vernon plant. â€œWherever we find contamination that we can link to Exide we are going to make them clean it up,â€ said Marxen. BOYLE HEIGHTS (CBSLA.com)Â â€“ A battery-recycling facility in Boyle Heights has started to remove lead-contaminated soil from neighboring homesÂ after results released for 85 of the homes tested indicated the existence of lead. Jim Marxen of the state Department of Toxic Substances Control said all of the 85 homes will need to be cleaned. The highest level was more than 3,000 parts per million in one home; however, the allowable level is 80. The lead-acid-battery recycling facility has been operating under various companiesÂ without a full permit for more than three decades. But a recent law signed by Gov. Jerry Brown will require the state to either issue a permit or shut down the plant by the end of next year. Strang says Exide wants the permit and has put $15 million worth of equipment into the plant to lower emissions. Salvador Chavezâ€™s home was first to be decontaminated and says his yard is now safe for his 17 grandchildren. But more than half the eligible homeownersÂ have not allowed their homes to be tested for lead, according to KCAL9â€™s Randy Paige, who says the DTSC hopes reluctant homeowners come around. In total, 103 homes have been tested but results werenâ€™t released for the remainder. The second phase of the cleanup of two residential neighborhoods near the Exide battery recycling plant in Vernon began Friday. 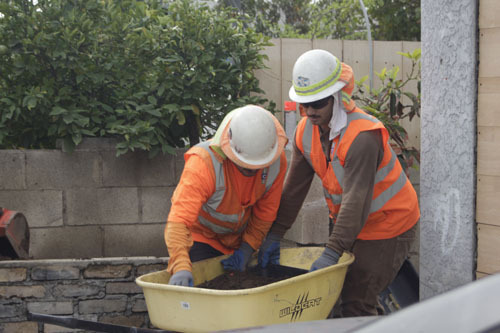 Crews began removing contaminated soil from two yards in Boyle Heights that contain concentrations of lead that could pose a risk to young children or women who are pregnant. In total, 19 homes in two neighborhoods in Boyle Heights and Maywood contain similar levels of lead, and will receive first priority for cleanup. These two neighborhoods were identified by the South Coast Air Quality Management District as the most likely to be impacted by lead emissions from the Exide battery recycling plant in Vernon. “We have kids here so we’re concerned about them,”Â said Albert Labrada, a neighbor of the two homes where excavation began Friday. Contaminated soil being removed was covered by tarps, to stop particulate matter from getting airborne, which air quality monitors were watching for. Exide was previously ordered by the State Department of Toxic SubstancesÂ to put aside $9 million to clean up the two neighborhoods. Last year, the state ordered operators of the plant to conduct testing in nearby neighborhoods north and south of the plant for environmental contamination by lead, arsenic, and other substances. AÂ report released in MarchÂ disclosed that concentrations of lead in excess ofÂ 80 parts per million (ppm) were found in the yards of 39 homes. Eighty ppm is deemed a “screening” threshold; California Public Health considers concentrations in excess of 400 ppm to be potentially harmful, especially to young children whose brain development can be impaired by lead poisoning. “We recognize the community’s concerns and are confident the Department’s tough new order provides strong regulatory oversight for cleaning the identified residential properties,”Â said Thomas Strang, an Exide vice president. Residents, environmental activists, and a number of Los Angeles County officials contend the plant, which dates to the 1920’s, has posed a threat to public health. Exide maintains there is no evidence of a direct link between its plant and the lead found in the yards, but pledges continued cooperation with government regulators. It is well-documented that two now-forbidden uses of lead as a chemical additive–in gasoline and in paint–released lead into urban environments over a period of decades. The state Department of Toxic Substances also ordered Exide to set aside $38.6 million for cleanup costs if the Vernon plant ever closes.